A World to explore. In the tradition of classical virtual worlds we can freely move, run, fly, even dive and ... relax! Rebuild from an old unity 3D demo to test intensively and finetune our, to come soon, BabelX3D avatar Flying kit. In this world our BabelX3D avatar Flying kit is using Arissa character (by Mixamo). 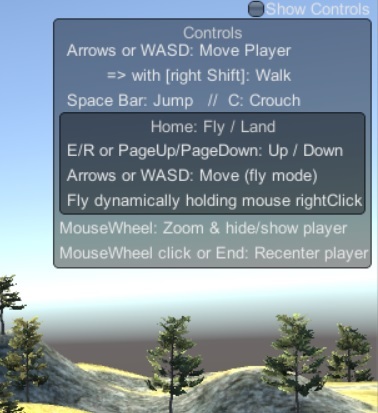 Help on interface show controls button gives all the Keys and Controls. Dive is, at this time, a kind of "Fly" on water with reduced speed and is activated automatically if water depth is significant.